“Enter as Strangers – Leave as Friends,” that is the sign over the counter at Gularte’s Great Diamond Deli & Pizza, which is located at 670-B Pleasant Valley Road in Diamond Springs, CA (same center as Jiffy Mart). And, they mean it. I was glad to hear that. I have an awful time deciding which bread, cheese, vegetables and condiments are best for a sandwich I have never tried before, so since they know what goes best, “their way” is the right way. I also do the same when confronted with the question regarding what I want on a taco or burrito. While waiting for my meal, I talked with Gularte for a few minutes. “I was born into a family of grocers in the Central Valley,” she said. “Growing up I learned a lot about food. Thirty years ago ‘Take and Bake’ pizza was unknown here and so we opened both this place and one in Placerville. After a few years it became apparent that running two stores was too difficult, so we closed the Placerville one. “You might note that we will be celebrating our thirtieth year on [Saturday and Sunday], the fourth and fifth of May by rolling back our one topping pizza to the 1983 price of $4.99. Soon, my sandwiches arrived. The P’ville Cheese Steak was hot roast beef, bell peppers, onions and melted cheese on a toasted roll, and the Hangtown Chipotle was hot turkey with melted cheese, mild green chillies, chipotle sauce (not mild), lettuce and tomato on grilled sourdough (Truckee Bakery bread). I tasted each of them, pausing between bites to enjoy some of their potato salad. They were different from each other, but both were full of flavor, juicy and delicious. I asked if the Hangtown Chipotle was more popular with men, because of the heat from the chipotle chiles, and was told that everyone seems to really like it. I guess tastes are a changing. While I was enjoying them, someone said, “You should make him a Garlic Gobbler,” so soon arrived a delicious sandwich of hot turkey, melted cheese, garlic mayo, lettuce, red onion and tomatoes on a toasted roll. After I enjoyed a couple of bites of it, I was asked, “Which one did you like the best?” “Actually, I liked them all,” I replied. At that point I figured I was done, but then they brought a sample of their delicious Beef Stroganoff, a fruit salad and even a sample of an iced mocha. I decided to take the fruit salad home, which I ate IN PLACE of dinner. You can have them make you any kind of a sandwich you want from a whole list of ingredients, but I would recommend the time tested ones like those I tried, along with others with names like The Sunrise (ham or bacon and eggs, with cheese), The Porker (pulled pork), The 49er (meatball), The Green Gardner ( a very special veggie sandwich) or The Diamond Dip, made with roast beef and melted cheese on a grilled roll with au jus. I didn’t try it but one diner yelled to the kitchen, “Best French Dip ever,” while I was there. As to the pizza, I had a delicious slice of Kelsey’s Combo, made with salami, pepperoni, sausage, mushrooms, red onions, olives, green bell peppers and tomatoes, and Jacob’s Club, a ranch sauce pizza with mozzarella, chicken, sausage, bacon (real) and diced tomatoes and loved each of them, the Jacob’s Club a bit more (I like white sauce pizza). You can customize a pizza from their long list of toppings (including cashews they roast themselves) or pick one from the menu, most of which are named after family members, such as Adam’s Artichoke, Brandi’s Garlic Chicken, Chip’s Mix, Emma’s Pizza Tostada, Granny’s Gardner… and the list goes on and on. They also have several salads, pre-packed to eat there or take home (try the walnut-cranberry) along with several casseroles like the very flavorful Stroganoff I really enjoyed, cookies, salsas, soup, cake, brownies and more. To drink they have soda, iced tea, mochas, fruit smoothies and bottled drinks. Tuesday is Homemade Taco day until 7 and Thursday is grilled hamburger day until 3. I haven’t tried the tacos, but I have tried the burgers, which are so huge and delicious that people line up for them. So, add the daily specials and I think that gives you a small glimpse of what Gularte’s Deli has to offer. I know I missed something, but I have to leave something for you to discover. The hours are daily from 8 until 8:30, but if you drive by earlier in the morning and the signs are lit, they are open. They have seating inside and outside and a very friendly staff. For more information give them a call (530) 626-0550. Picture courtesy of Steve Crandell, Photo Restoration, Placerville, CA. On September 9, 1850, California officially became a State. Feeling that Hangtown was an inappropriate name for a community, the legislature pondered naming it either Ravine City or Placerville, with the latter winning out. 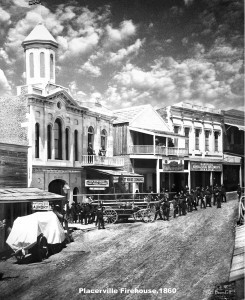 As a result of the change in the status of California, things began to settle down and become more organized in the town of Placerville. Everyone knew that with statehood, immigration would increase. With more people the possibility of fire would increase substantially, and fire was the scourge of the mining communities. The early buildings were all built of wood and canvas; wood was the only source of heat and oil lamps provided all of the light. In a crowded town like Placerville, fire was everywhere, waiting to spread and the citizens were concerned. Prior to 1853 fires were fought by whoever was around, using whatever they had handy. Obviously it was a poor system, especially if a fire started to spread. The next order of business was to have a carriage built and purchase fire hose. A Mr. Alfred Bell generously advanced the necessary funds for the equipment, a debt that was paid back by a benefit performance of the Lee & Marshal Pioneer Circus, which raised some $900 for the group. The first home for this fledgling company was on Maiden Lane (later Centre Street and now Stagecoach Alley), but it was not a good location. Later, when the town was incorporated, the company applied for and obtained an appropriation to purchase a house and lot on Main Street. Unfortunately, the great fire of July 6, 1856 destroyed the building, along with all of their hose, furniture and fixtures. To make matters worse, the Town Council, a few days after the fire, sold the now empty lot to a Mr. Dorsey. For a year the Neptune Company had no home for their carriage and considered disbandment. Fortunately, by 1858 they were able to raise enough money by subscription to purchase a home on Coloma Street, change their name to Neptune Engine Co. No. 2, and order a new fire engine from Hunneman & Co. in Boston. Just prior to that, on April 13, 1857, another engine company was organize under the name of the “Mountaineer Engine Co. No. 1.” They soon purchased an engine and 250 feet of hose from Engine Co. No. 1 of Sacramento. When the equipment arrived, they found that Confidence Engine Company No. 1 was so deeply carved into the side of the engine that it would be impossible to remove it. Being people who knew how to solve problems rapidly, they simply changed the name of their company to match that on the engine. After 12 years Confidence Engine Company No. 1. was forced to cease operations. They had received little financial support from the City and were deeply in debt. The citizens would not allow this to happen and gave a festival which raised $396.35. This, and generous subscriptions saved the company. The word “Confidence” is still on the front of the City Hall, a reminder of the days when they were headquarters in that building.